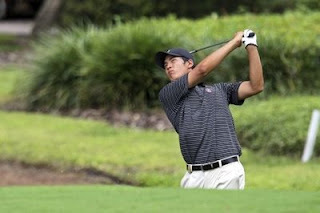 While on Christmas break, Stanford freshman David Chung finished in a tie for 7th at 9 under par in the Dixie Amateur completed Dec 23rd at Heron Bay Golf Club in Coral Springs, Florida. He shot rounds of 70-67-73-69 - here are the complete results from this prestigious tournament. The holidays are upon us and that means we are in the off season. The fall schedule sure did fly by and as I reflect back I see a lot of good things to look forward too as we approach the spring season and the road to NCAA’s. We capped off the fall with a nice showing at The Cordevalle Collegiate. The course played difficult this year as they added a bit of length but all in all our guys played well and a second place finish to a hot USC team was a fine showing. I feel we will be seeing a lot of the Trojans this year on the final day so vengeance is ours!!! A highlight to the fall was a visit to Isleworth and the home of Tiger Woods. To be in the presence of greatness and see and hear what it takes to get there was pure magic. He was truly inspirational and I think our guys walked away with a better idea of what it takes to win, not only on the course, but in life as well. The question I am left with going into the start of the New Year is who our top 5 will be. It’s a great problem to have and exciting to think about and I look forward to see who steps up! There was an epic match for the fifth spot to make the trip to Isleworth this past October and I foresee a lot of that happening this spring. Having the depth and the talent that we have only leads these kids to a much higher level of engagement in which case all boats rise. 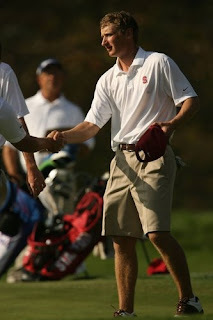 Its fun to be a part of and it’s what Stanford Golf is all about. Thanks to everyone for all your support and Go Cardinal! Head Coach Conrad Ray has signed two talented high school seniors to athletic scholarships for 2009-2010. Andre De Decker and Andrew Yun will join the Cardinal on the links next season. The official announcement about these outstanding players by Stanford is included below. Stanford, Calif. - The Stanford men's golf program has signed a pair of talented high school seniors announced Head Coach Conrad Ray today. Andre DeDecker and Andrew Yun will join the Cardinal for the 2009-2010 season. DeDecker, from Cape Town South Africa, is regarded as the one of the top juniors players in all of South Africa. 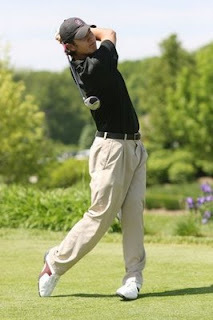 In 2006 he was the Under 16 National Champion, and the Under 18 Schools Golf Champion at Sun City. We has also been a member of the South African National Team in 2006, 2007, and 2008. In 2007 DeDecker finished 2nd in the South African Amateur, Round of 16 in The Western Province Open, and 14th in The South African Amateur Match Play. 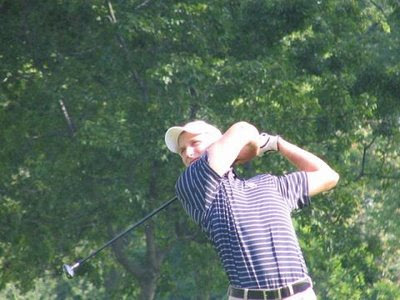 In 2008 DeDecker placed 2nd in the South African Boys Stroke Play, 1st in the Dale Hays Classic and 14th in the Rolex Tournament of Champions on the AJGA Tour. Andrew Yun, from Chandler Arizona, is a four time Junior All-American on the AJGA Tour. 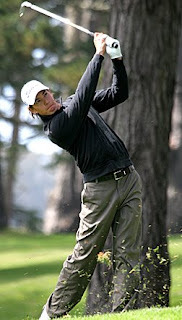 He finished 1st in the 2007 Arizona Amateur and 2nd in the 2007 Arizona Public Links Championships. 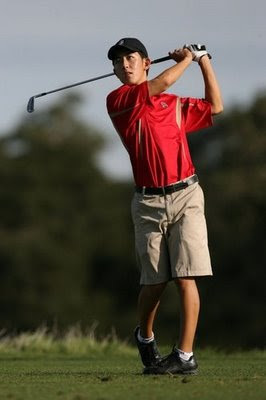 In 2008 he finished 1st in the Verizon Junior Heritage, 6th in the Heather Farr Classic, 3rd in the Ping Invitational, and 5th in the stroke play portion of the US Junior Amateur, eventually losing in the quarterfinal round of match play. "Andre and Andrew are fantastic additions to our squad. We are very happy that they have chosen Stanford and they will both leave their mark on our program over the next four years. Both share a wealth of competitive golf experience and I would not be surprised if both were able to come in and play a lot in their freshmen campaigns." The pair will begin at Stanford in the fall of 2009, and help the Cardinal in its quest for the 2010 NCAA title. 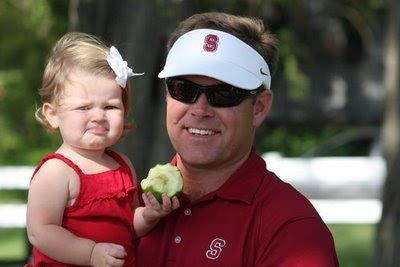 Stanford photo of Conrad Ray and his daughter Ella at the 2007 national championships where the Cardinal finished 2nd. 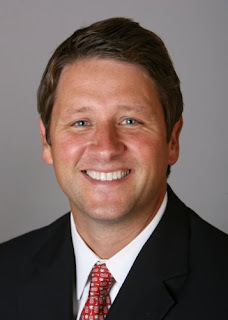 Golf Week magazine does a video interview with head coach Conrad Ray, selected as the national coach of the year in 2007. This interview covers a lot of ground in small amount of time touching on the 1994 national championship team that Conrad was a player on and the 2007 national championship team that Conrad coached. Stanford finished 2nd in the CordeValle Collegiate played in San Martin, CA, behind a dominant performance by USC which won the team title by 26 shots. Three Cardinal players finished in the top 10 individually with Sihwan Kim tying for 4th at 2-under par, Joseph Bramlett in 6th at even par and Jordan Cox tying for 10th at 2-over playing as an individual. The unique format had each team including 6 players with the low 5 rounds each day counting towards the team score, instead of the typical event with 5 players on a squad. The four remaining Stanford players who counted for the team included David Chung at 11-over and the trio of players, Kemmer, Lim and Ziegler, all at 12-over. Stanford's team will now be off until they return to action Feb 4th on the Big Island in Hawaii. After two rounds Stanford is in 2nd place but finds itself 19 strokes behind a red-hot USC team which has 3 players at the top of the individual leaderboard. Stanford is led by its two All-Americans, Sihwan Kim at 1-under and in 6th place and Joseph Bramlett tied for 7th at even par. An encouraging note is the play of junior Jordan Cox who is in 10th place at 1-over par, although he is playing as an individual so his scores don't count towards team play. The weather has been on the cool side and the 2nd round was marked by gusty winds throughout the day making scoring conditions tough. The CordeValle course is showing its teeth given the conditions with the average scoring around 76 shots per round and the low round over the first two days was a 68. Only two other rounds were under 70, one being Sihwan Kim's first round 69 that tied him for the individual lead after day one. In the second round the gusty winds led to erratic play by the entire field, including the Cardinal team. Cox's low team round of 70 included 7 birdies, 5 on the front nine when he made the turn at 3-under 33. Kim's round included a double bogey 7 on the par 5 third hold but he came back to close with an eagle on the par 5 18th hole over water. That 18th hole proved to be tough on two of the Cardinal players as Bramlett and Kemmer both finished with double bogies, in Bramlett's case that led to a still solid 1-over 73. Bramlett offset two double bogeys with five birdies. Playing for the Cardinal in the 54-hole three-day tournament will be Sihwan Kim, Joseph Bramlett, David Chung, Steve Ziegler, Daniel Lim, and Dodge Kemmer. Jordan Cox will also be competing as an individual. Kim was last year's CordeValle individual champion, and helped the team to a second place finish. Four other Golfweek top 50 teams will be joining Stanford in the tournament: Arizona, No. 2 Arkansas, No. 36 Augusta State, Charlotte, Coastal Carolina, No. 18 Lamar, Northwestern, Santa Clara, UCLA, USC, and No. 9 Washington. The Cardinal is paired with Lamar and Lim will be the first to tee off on the first hole at 8 a.m. to begin the tournament. 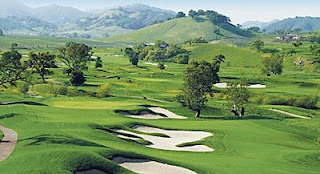 For more information about the CordeValle Golf Course, please visit http://cordevalle.com/golf.cfm. Stanford finished 8th against a strong field at the Isleworth Collegiate in Windermere, Florida. Cold, windy weather greeted the golfers on a day that began in the high 40s and only reached the 60s later in the afternoon. Winds gusted to 20 miles per hour throughout the round and scored soared for all the teams. Final round scores included three 76s by Joseph Bramlett, Steve Ziegler and Dodge Kemmer while David Chung posted an 80 and Sihwan Kim struggled to a 85. A final day log can be found at this tournament website. Stanford sends it's young talented squad back to Tiger's home course in Windermere, Florida. Competing this year are Sihwan Kim, Joseph Bramlett, Dodge Kemmer, Steve Ziegler and David Chung - one senior, one junior, two sophomores and a freshman. Stanford moved up 6 places to a tie for 8th place among the 18 elite teams playing at the Isleworth Collegiate in Windermere, Florida. Bramlett's (photo below) tournament best 5-under par 67 led the Cardinal who improved by 9 shots under their first day total. Ziegler and Chung followed with 74, while Kemmer had a 77 and Kim a 78. Bramlett's round featured 6 birdies and one bogey over the tough Isleworth course, moving him up to a tie for 13th place individually despite an opening round 77. Against an elite field of the nation's best teams, it was a tough first round for the Cardinal at the Isleworth Collegiate as the team is tied for 14th place, 14 shots behind the Alabama. Stanford was led by sophomore Steve Ziegler's 1-over 73, followed by freshman David Chung's 75, sophomore Sihwan Kim's 76 and two 77s from junior Joseph Bramlett and senior Dodge Kemmer. With two days remaining there are plenty of holes for the team to get back into contention. Indiana’s Jorge Campillo are tied for first in the individual standings at 4-under-par 68." by Southern California (290, +2)." Stanford sends it's young talented squad back to Tiger's home course in Windermere, Florida. Competing this year will be Sihwan Kim, Joseph Bramlett, Dodge Kemmer, Steve Ziegler and David Chung - one senior, one junior, two sophomores and a freshman. From the tournament website: "Eighteen of the best men’s golf teams in the country will compete in the nation’s premier college tournament when play begins at the fifth-annual Isleworth-UCF Collegiate Invitational on Sunday morning . The three-day, three-round tournament at the Isleworth Golf & Country Club in Windermere includes eight of the top-10 squads in the country. In total, 13 of the 18 teams in this year’s event are ranked in the top-30 nationally, including the host Knights (30). According to the latest Golfweek/Sagarin Performance Index, Oklahoma State is the top team in the country. Tournament participants Southern Cal (3), Georgia (4), Illinois (5), Stanford (6), South Carolina (8), Texas (9) and Alabama (10) join the Cowboys in the top 10." Stanford finished 3rd in the Prestige played at PGA West on the Greg Norman course in a tourney it co-hosts with UC Davis. Leading the way was TCU winning by 10 over 2nd place UC Davis while the Cardinal was another 8 shots behind Davis. Final results on the surface look good as Stanford had 4 individuals placing in the top 20, but what largely separated the top two teams from the field was the very strong play from the two players who tied for first individually at 6-under par. 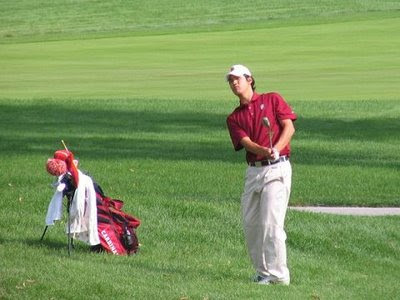 Stanford's best, Sihwan Kim, finished at two-over par in a tie for 8th place. TCU also had two other players finishing tied for 5th at 1-over par leading to their dominating win. After Kim, Steve Ziegler's last two solid rounds included a 2-under 70 final round to move him into a tie for 11th with teammate Joseph Bramlett who finished with a final round 75. Freshman David Chung had a top-20 finish with his 3rd round 73 leading to his tie for 15th place overall. Daniel Lim finished with a 76 to tie for 63rd. Playing as individuals Dodge Kemmer had a 75 last round to finish tied for 30th overall and Jordan Cox had a 73 on his third round and finished tied for 76th place overall. Next up is a major test against the nation's elite teams in Windermere, Florida, home of Tiger Woods and the Isleworth Country Club, site of the upcoming tournament. Stanford will look to improve its play from all team members in order to compete for this top event. Desert golf at La Quinta, California, is proving to be a challenge for the teams competing at the Prestige played on the Greg Norman course at PGA West. In the morning round of the 36-hole first day, unseasonably cool temperatures in the fifties to start the day combined with Santa Ana winds that gusted to 30 miles per hour led to very high scores. Stanford was in 2nd by 3 strokes behind TCU after the morning round 9-over par 597 being led by Joseph Bramlett's 72, Sihwan Kim and David Chung's 74s and Steve Ziegler's 77. Daniel Lim's 78 was not counted as the low four scores are used each round. Dodge Kemmer and Jordan Cox played as individuals shooting 74 and 84 respectively. The winds subsided a bit though still gusting and the desert heated up into the low eighties but the second round followed the same pattern as Stanford improved to 592 was again lost 3 shots to TCU falling 6-shots behind. Meanwhile UC Davis had a torrid 582 score led by a sparkling 63 from their top player. Stanford scores in the afternoon were Kim 72, Bramlett 73, Ziegler 73, Chung 74, Lim 78, Kemmer 78 and Cox 79 were disappointing with nobody going low. The pattern of play in the first round for all but Kim and Bramlett was that doubles, triples and quads would mar otherwise decent golf on a day when pars were at a premium. Chung's 74 included a triple, for example. In the 2nd round, again Kim and Bramlett were the only players who managed to avoid a score worse than a bogey. Individually the Cardinal has three players in the top ten led by Bramlett's tied for 4th. It will take a solid last round to claim this title but Stanford is certainly very capable of pulling that off. One of the nation's top amateur events, the Western Amateur, played in Benton Harbor, Michigan, with three Stanford golfers in the field, Sihwan Kim and incoming freshmen David Chung and Wilson Bowen. Sihwan Kim had another excellent tournament in the grueling Western Amateur. After four rounds of medal play where Sihwan shot 68-71-67-72 to qualify for the 16-player match play portion of the tournament. In his first match he beat USC's Rory Hie 5-4 and in an afternoon match lost to a tough French Amateur 2-1, 18 year old Victor Dubuisson. Here you will find more tournament information through Sihwan's quarterfinal match..
Incoming freshmen David Chung (74-70 and Wilson Bowen (68-75 both missed the cut by one shot. The low 41 & ties after 36 holes of qualifying will continue play with two more rounds of stroke play with a cut to 16 players who move into match play. Here is the tournament's website for complete information. Rising sophomore Steve Ziegler finished tied for 10th at the Colorado Open behind 8 pros with rounds of 69-71-69-72. 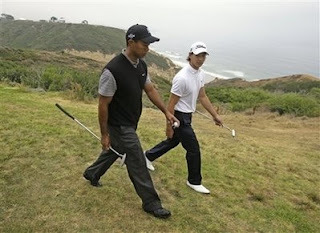 Next major compeitition for Steve will be the Pacific Coast Amateur Aug 5-8. "Kim recorded the best finish of the seven All-American sponsor invitees with his tie for sixth in his first professional event. After an even-par front nine, Kim birdied the 10th and made eagle at the 12th when he holed a 25-foot chip from just off the green. A bogey at No. 13 dropped him back to 2 under where he eventually finished. 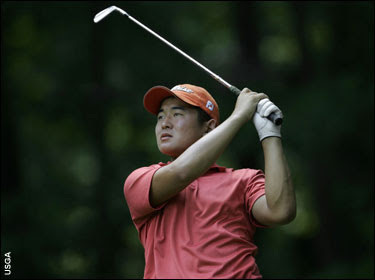 Kim came to the United States from South Korea in 2000 and was the second Stanford freshman to be named first-team All-American -- the first was Tiger Woods. 'I tried really hard to prepare for college golf because I saw a lot of guys fading away after they get into college," he said. "I learned from Coach (Conrad) Ray, who used to play on the Nationwide Tour, about game management and the mental game also.' "
Here's a final recap from the Nationwide Tour's website. Complete Leaderboard of the Nationwide Tour event in Columbus, Ohio. Sihwan Kim continued his outstanding play against the pros in a Nationwide Tour event with a 3rd round 70 leaving him 7 shots out of the lead. His second round 71, 1-over the very tough Ohio State Scarlet Course in Columbus, left Sihwan 6-shots out of the lead in this Nationwide Tour event. Continuing his very active summer tournament schedule, Sihwan Kim opened play at a Nationwide Tour event with an even par 72 first round score. You can follow results each day from the leaderboard link below. Sihwan received a sponsor's exemption allowing him to compete with a number of former PGA tour regulars as well as a host of up and coming professionals who will be moving onto the big tour next year. As only the 2nd Stanford freshman to gain first team All-American honors (Tiger Woods was the other one), Sihwan has many opportunities to play in elite amateur and now pro events. Incoming freshman David Chung, from North Carolina, completed play at the Porter Cup shooting even par 280 to tie for 11th against an outstanding field of US and international amateurs. David was tied for 7th after his 3rd round 71 left him 7 shots behind the co-leaders against this very strong field. Chung moved into a tie for 5th place with a 2nd round 68 following up his 69 in the first round at the prestigious Porter Cup amateur event held in Niagara Falls, NY. 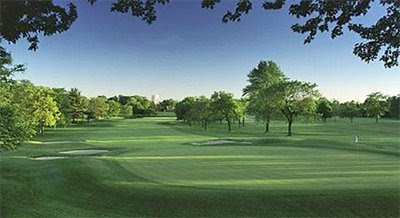 For complete results click here: http://www.portercup.com/pscores2.asp. Further results in this 4-round medal play tournament will be posted here as they occur. David was tied for 14th after day one when he shot a solid 1-under 69. The Porter Cup is always one of the nation's top amateur tournaments and this year is no exception. The Porter Cup website includes a profile of all players including a summary of Chung's outstanding junior career. According to the Porter Cup website, "over the years, many of today’s top professional players have played here. Past Porter Cup Champions include Phil Mickelson, Scott Verplank, Ben Crenshaw, David Duval and Jay Sigel. Other noteworthy alumni include Tiger Woods, Jim Furyk, Adam Scott, Mike Weir, Mark O’Meara, Curtis Strange, Craig Stadler, Lanny Wadkins and many, many others." All-American rising sophomore Sihwan Kim tied for 31st at the Southern Amateur played in Orlando at the Lake Nona Golf & Country Club with a 1-under 287 total. See complete scoring for this outstanding field of amateurs from around the world. Sihwan will be playing this week in a Nationwide Tour event up against a much stronger level of competition than he has faced in any amateur event. We'll keep you posted on his play on this professional tour. qualifying for the US Amateur (July 26-Aug 5 with the event starting August 18th), the Western Amateur (July 28-Aug 3) where Jordan Cox, Sihwan Kim and incoming freshman William Bower and David Chung will also compete, the Porter Cup (July 23-26) where David Chung is entered, and the Pacific Coast Amateur held Aug 5-8. Final results are in for the Player's Amateur in South Carolina with Sihwan Kim in 6th place overall at 11-under after rounds of 66-67-68-68. Daniel Lim finished at 2-over par with rounds of 72-69-71-70 followed by Dodge Kemmer at 5-over and rounds of 72-74-68-71. Two other Stanford competitors missed the final round cut --- see below for details. Earlier posts of results are included below. See complete results. Here is the tournament home website. Three rounds have been completed at the Player's Amateur and Sihwan Kim is tied for 5th at 9-under par with rounds of 66-67-68. Daniel Lim is next at 2-over par shooting 72-69-71 followed by Dodge Kemmer's 4-over 72-74-68. Just missing the final round cut were Jordan Cox at 8-over shooting 72-76-70 and incoming freshman David Chung at 9-over shooting 75-74-70. First round results at the 8th annual Player's Amateur championship in Bluffton, South Carolina included 5 Stanford players. Sihwan Kim led the way with a 66 and is 1 shot off the lead. A trio of 72s were fired by Dodge Kemmer, Daniel Lim and Jordan Cox while incoming freshman David Chung shot a 75. Incoming freshman Wilson Bowen from Illinois struggled shooting 88-87-79. Play will continue with 3 more rounds of stroke play with a cut after today's 2nd round. The tournament is being held on the Belfair Golf Club, a Tom Fazio designed course, and it has attracted many of the nation's finest college golfers. Sihwan Kim and Daniel Lim competed against a top field at the Sahalee Country Club in the Seattle area. Sihwan shot 77-74-76 to tie for 34th on the tough course while Daniel shot 77-76-81 to finish tied for 51st. See complete results. Rising sophomore Steve Ziegler was beaten in his 2nd round match at the North & South Amateur in Pinehurst, North Carolina by Adam Long, a rising junior at Duke. Complete information can be found at the tournament website. 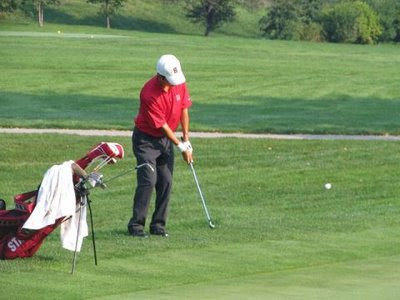 Two other Cardinal players, senior Dodge Kemmer and incoming freshman David Chung, competed but did not make it into match play -- see the recent update below. Stanford sophomore Steve Ziegler wins his first round match over Connor McHenry 3 & 2 to advance to play Adam Long today at the famed Pinehurst #2 course designed by Donald Ross. Three Stanford golfers, Dodge Kemmer (right photo), Steve Ziegler and incoming freshman David Chung, competed in the prestigious North & South Amateur played at the famous Pinehurst resort. Ziegler was able to advance to match play with his rounds of 69-75 at the Pinehurst #2 and #7 courses. Kemmer shot 77-72 and Chung 78-72 to miss the qualifying mark by 3 & 4 shots respectively. 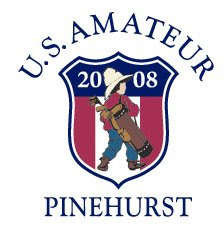 Qualifying rounds results are available here: http://www.pinehurst.com/new/images/tournament/Final%20Qualifying%20Results.pdf.